802.11ac wireless was introduced at CES 2012. Unfortunately when the devices were launched there were no adapters to support it. This meant that people were buying expensive wireless products without having any way to support the speeds they were capable of. 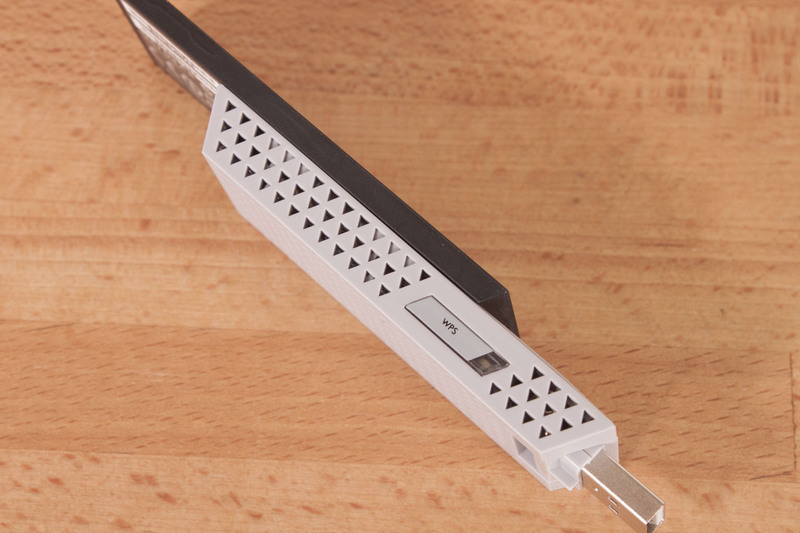 Fortunately at CES 2013 a couple of manufacturers started releasing 802.11ac adapters. However, there are two schools of thought about how to implement these adapters. 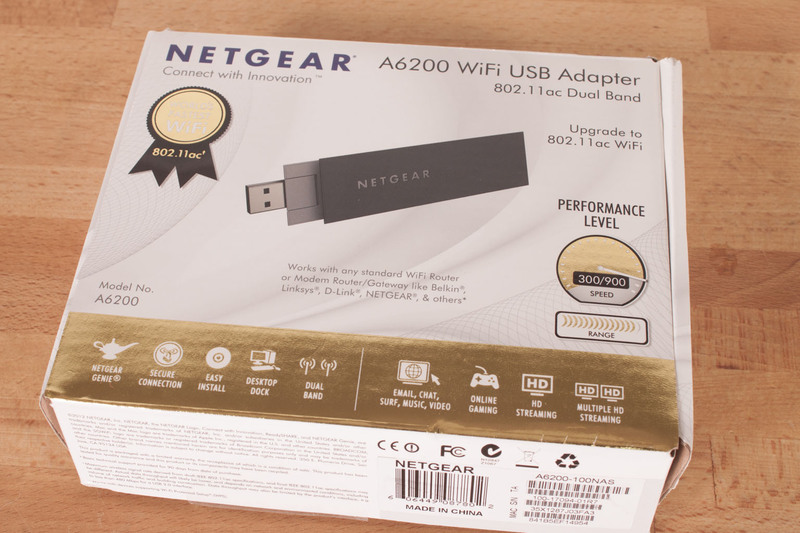 We will be taking a look at both in the next couple of weeks, but we will kick things off with a look at the USB 2.0 NETGEAR A6200 Dual Band 802.11ac WiFi Adapter. Let’s dive in and take a look. The box that our A6200 arrived in looked pretty good although there is a little bit more gold on the box that I personally like. 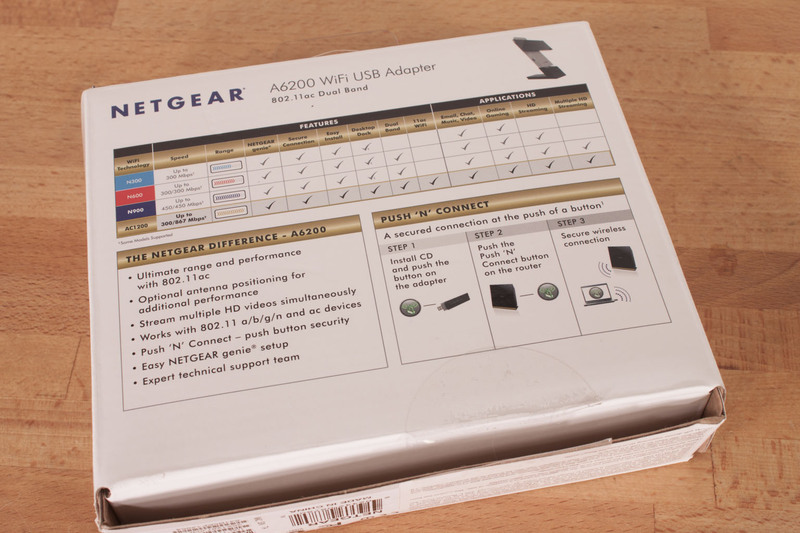 NETGEAR does give you a good look at the adapter and a nice comparison chart on the back. If you were looking for something in a package store I am not sure that you would pick this over another product. The white background and gold foil might give the impression that it is well, cheap. After we get past the box (fairly easy) we find that NETGEAR has dropped in everything you need to get the A6200 working on your computer. NETGEAR even threw in an adapter so that you can put this on your desk or, extend it away from your laptop if you want to. Of course you also get a CD with drivers and utilities, but who is really going to use that. 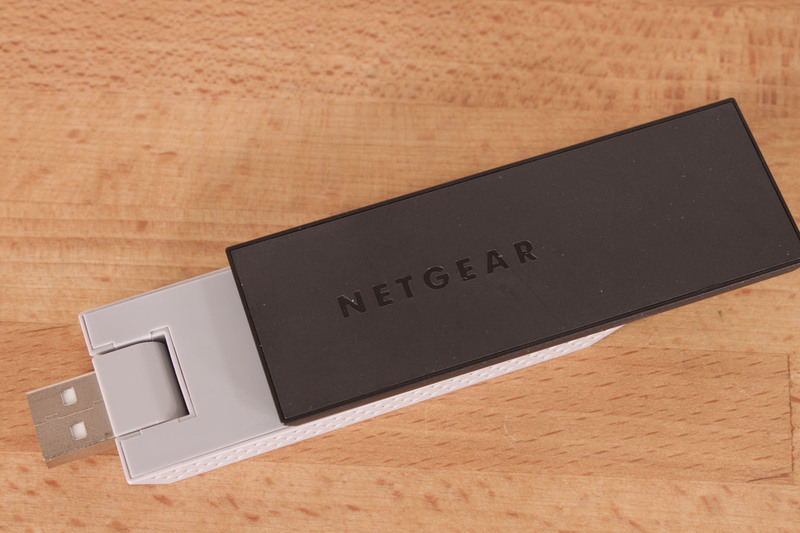 The NETGEAR A6200 is a pretty cool looking adapter. The design is a little bit of a departure from the norm, but it looks good. 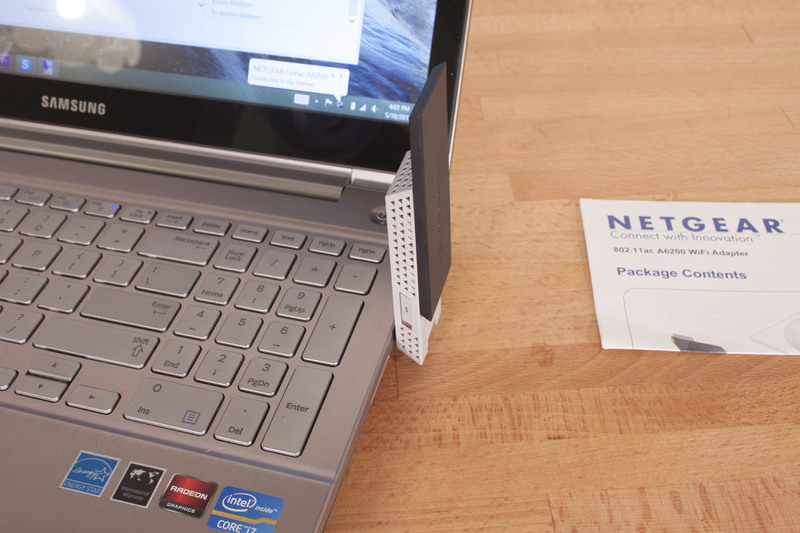 One thing that NETGEAR did that is pretty cool is that they put the USB plug on a hinge so that it is not sticking out of the side of your laptop. This is actually a nice feature when you think about it. Inside the A6200 is Broadcom BCM43526 which is capable of pushing data at a theoretical 1.3Gbps, but due to the use of USB 2.0 you are only going to get a max of 867Mbps. This is still an amazing data rate and certainly nothing to balk at. The A6200 has WPS (Wireless Protected Setup), but they call it Push ‘N’ Connect. Different name same results. Right next to this is an LED that glows orange if you are connected to a 2.4GHz network and blue if you are connected to a 5GHz network. You also get dual band flexibility which means you can connect using 2.4GHz or 5GHz. If you connect at 2.4GHz you will not get the full 867Mbps, but will drop down to 300Mbps. The reason for this is that 2.4GHz typically is used for b, g, and n but not the older (yet more stable) a spec wireless. 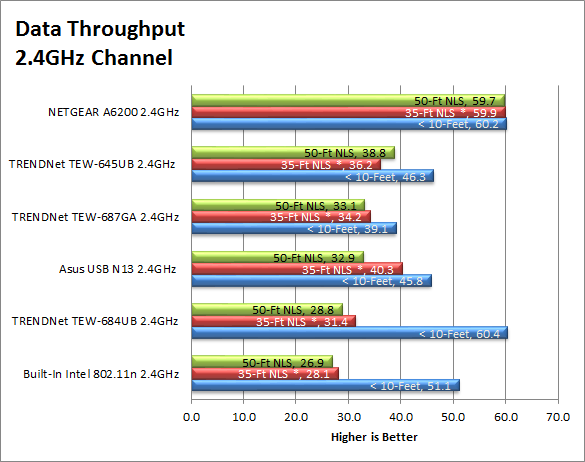 At 5GHz you can run using a, n, and ac which will give you that extra speed that 802.11ac brings to the table. Sadly we were not able to pull the A6200 apart simply because doing so would have damaged the device and the antenna. However, from the connection speed and the overall performance we are guessing there are at least 2 antenna under the hood. 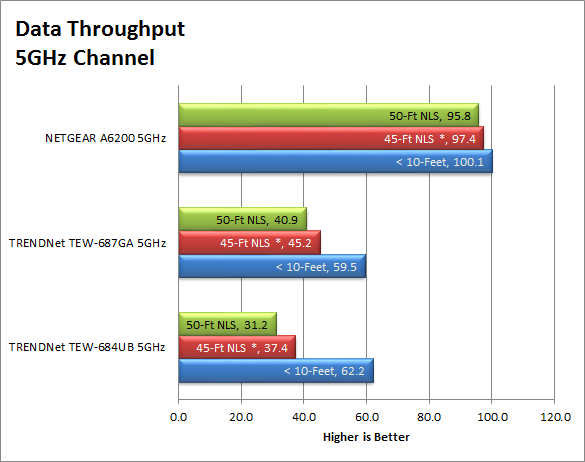 If there were three (allowing for 3 spatial streams), our 2.4GHz, n speed would be 450Mbp/s. Fortunately for 802.11ac you do not need as many antenna to get the higher levels of performance (which is good news for mobile). NETGEAR also has included a feature called BEAMFORMING+ which is supposed to help improve speed and range. The software that NETGEAR includes with the A6200 is not bad. Usually I like to allow Windows to control networking as having a third party application controlling it can affect performance. Here it is Windows 8 that slows things down a little. When I first installed the A6200 on out new Samsung Series-7 Chronos laptop Windows 8 was able to connect using 802.11ac. All we saw for speed was 300Mbps n even on the 5GHz band. 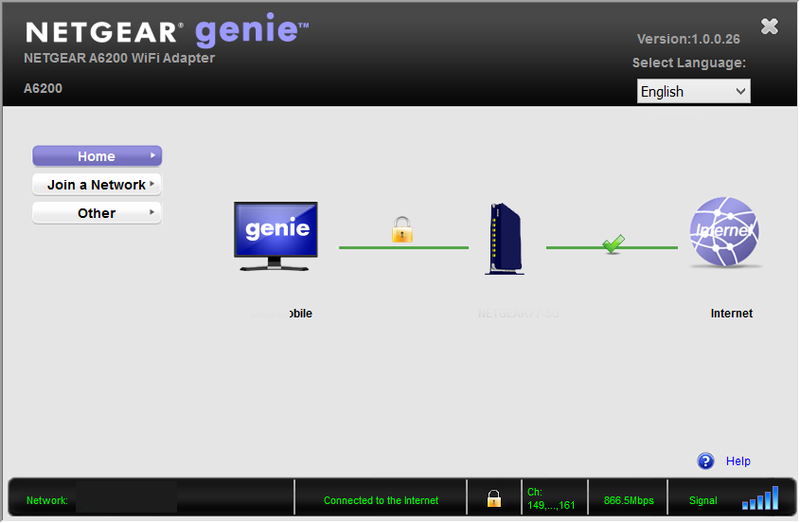 It was not until we installed the NETGEAR Genie that we started seeing the speeds we were expecting. 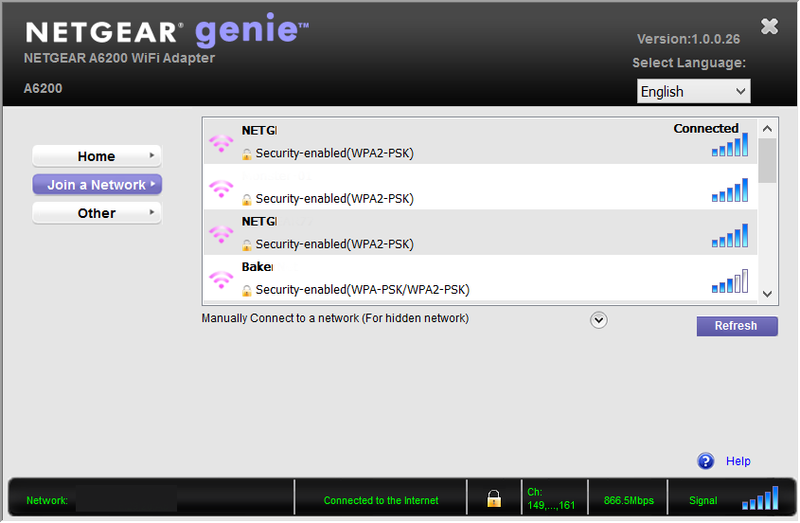 When you open up the NETGEAR Genie application you start off staring at the networks available in your area. When you find the network you want and click it to connect you will get two options; one to connect manually and the other to connect using NETGEAR’s Push ‘N’ Connect. We chose to do things manually as WPS can still be something of a security risk. The rest of the application is informative, but really does not bring anything else to the tablet with the exception of the update and diagnostic info buttons found on the other page. Still it was the only page that let us know we were connected using ac. Windows 8 still thought we were connected using 802.11n, it was unusual to see this happen and yet get the speeds we were. We have said it before and we will say it again; you cannot count performance by numbers alone. We will always give you both the raw numbers as well as the other items that make up for how well (or not so well) a product works. 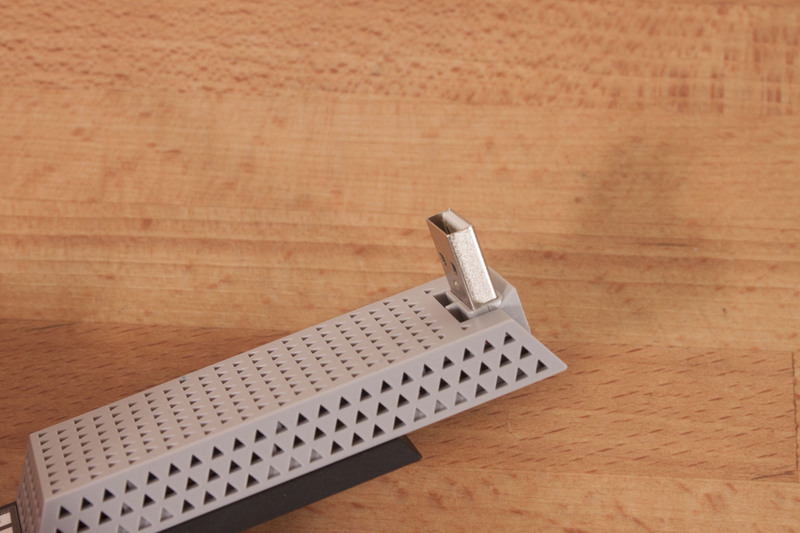 These are items like how quickly a USB adapter can initialize once it is plugged in. How quickly does it connect? 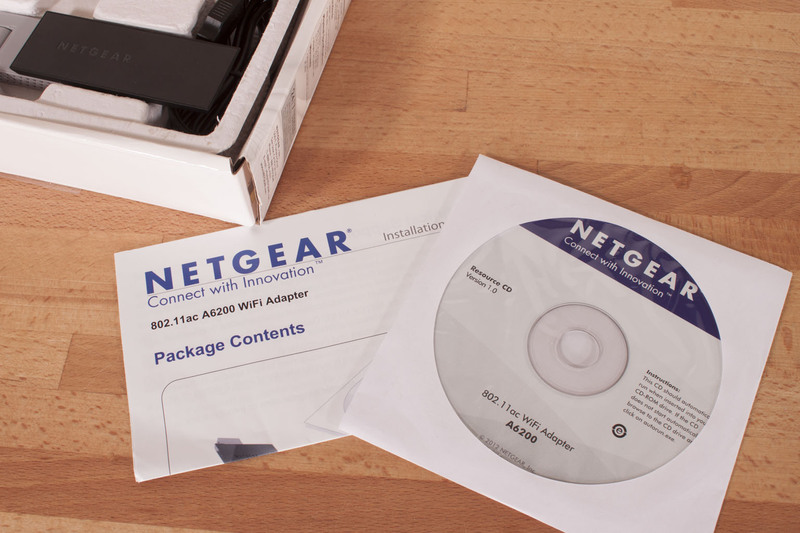 We take a look at all of these for the NETGEAR A6200. 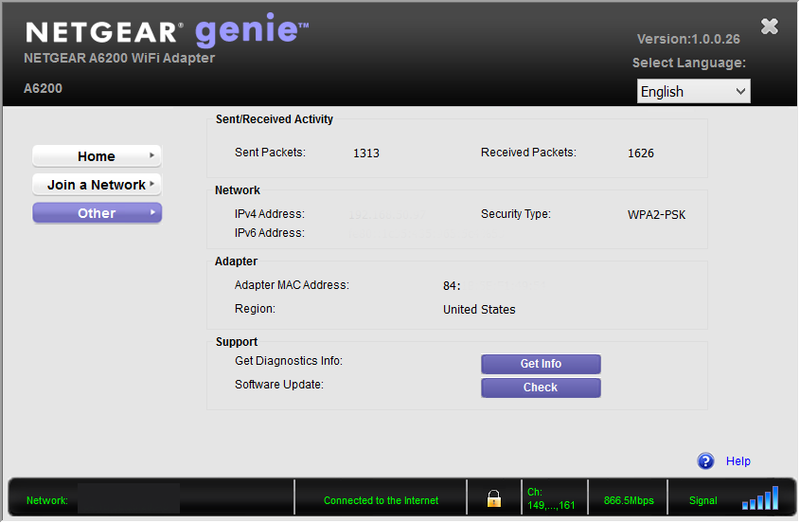 For testing we used a NETGEAR R6300 802.11ac Dual Band (Concurrent) Wireless Router. We connected to these at 10-feet, 45-feet, and 50-feet. The 10 and 45 foot tests were inside the house proper and the 50 foot test was outside through the Cinder Block walls. We tested the adapter using both the 2.4GHz and 5GHz band. 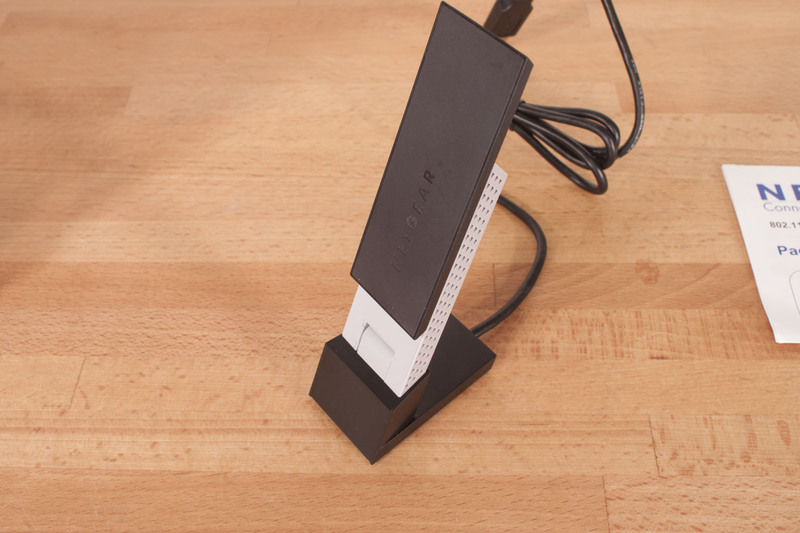 We compared this to other adapters on the market using the same R6300 router. The results were eye opening to say the least. The reception on the A6200 was excellent. It has a good combination of antenna and power for return transmission. We had good speeds even outside the house and across our street (about 100 feet). We were a little surprised considering the fact that the A6200 did not have a major impact on our battery life. As we mentioned 2.4GHz and 5GHz will have different maximum link speeds. We were able to hit the maximum for both when connected to the R6300. The only time we saw our link speed drop was, of course, when we moved outside the house where reception started to drop off. Still within the house we had 300Mbps over the 2.4GHz channel and 850-867Mbps over the 5GHz channel. Although benchmarks are great they are not going to tell the full story. 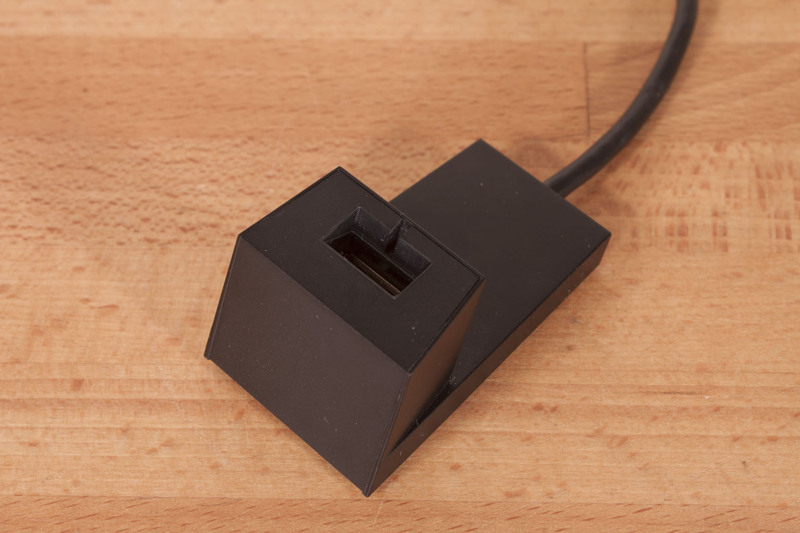 We also like to take a look at things you will really use a network adapter for. Here we took a 3.37GB ISO and moved it from a NAS device to our laptop. The data transfer was impressive with an average transfer rate of 30MB/s. The whole move took a little more less than two minutes. Not bad for a wireless connection. With the A6300 we were able to pull in a couple of different video streams without any issue. It was interesting to see this in action. 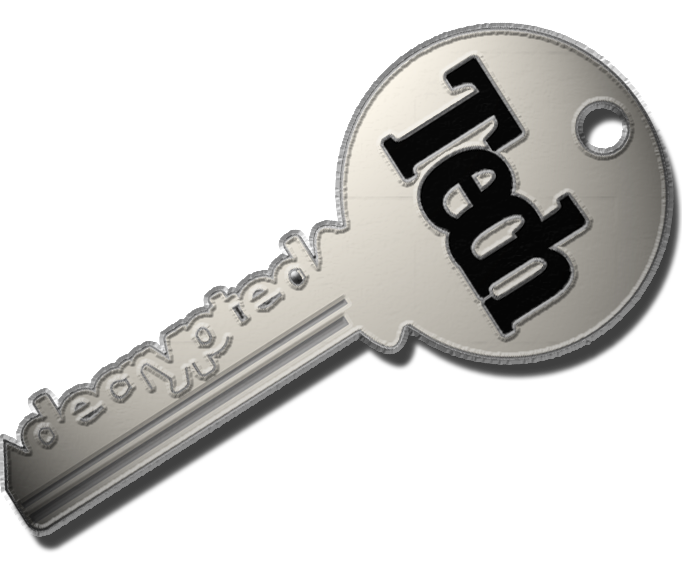 We were able to run Netflix, YouTube and an internal stream without stuttering in either video or audio. We do not see many people using this feature (and there are 802.11n adapters that can do the same thing), but it still shows that you are going to have enough bandwidth available to watch the videos you want. Value is another very subjective topic. What is expensive to some might be a deal to others. You can look at this topic in multiple ways. One is raw price and the other is what you get for the money. Each is accurate and both are correct ways to look at price/value. We tend to look at features, performance and real-property when we discuss value. However, we also take into account the raw cash cost of the item. From most e-tailers the A6200 will run you about $60 which is a very good price for the speeds you are going to get. Of course you need to have the router to support it which means that your cost to get the faster speeds will be more depending on the brand of ax router you go with. When we first saw that the NETGEAR A6200 was a USB 2.0 device we were concerned about performance. After all there is a limit to how much data you can push through a USB 2.0 port. Sadly this limit is below what 802.11ac is capable of. We were glad to see that even with that limitation you still get great performance and with fairly small price tag. If you are running Windows 8 you will want to install and use the NETGEAR Genie just to make sure you are getting the speed you are supposed to. We tried without the NETGEAR software and our performance was not as good. Now before you rush out and grab one of these remember that you need to have an 802.11ac router or access point before you can get the full benefit of the A6200. If you are going to invest in an 802.11ac network the NETGEAR A6200 USB WiFi adapter certainly would be an excellent option. We are awarding the A6200 our Silver Key award for its combination of value and performance.